What's left of us after we're gone? Are the moments we live really as impermanent as they seem? Or could they remain somewhere, merely waiting to be replayed? And could we ourselves remain? Just a piece, a shape, an echo lingering and refusing to let go -- always watching. 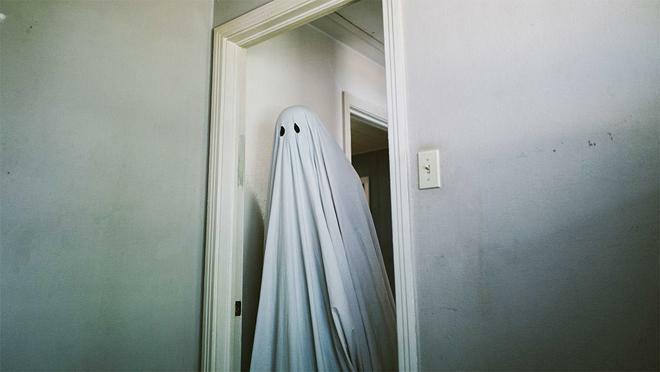 As time and memory dalliance with love and loss, David Lowery's A Ghost Story probes deep into the cosmic uncertainties of existence, using powerful cinematic ambiguity and poetic rhythms to turn a walking bed sheet into an achingly poignant vision of life and death. 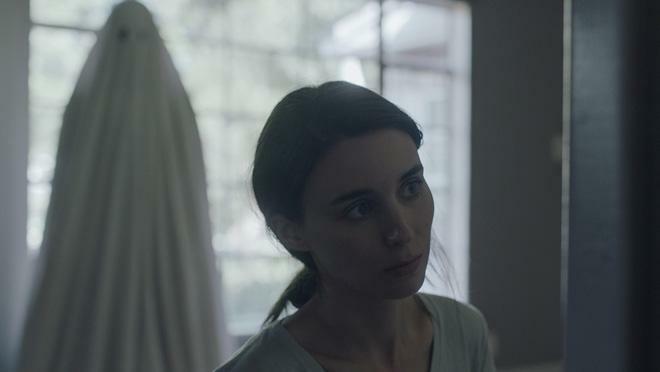 The loose story focuses on a husband, credited simply as "C" (Casey Affleck), and wife, credited simply as "M" (Rooney Mara), as they prepare to move out of their house. After the man suddenly dies in a car accident, his ghost (draped in a white sheet) returns to the home and watches M grieve. When she eventually moves, the ghost lingers in the house, observing new tenants throughout the years as he occasionally attempts to retrieve a note his wife left hidden in one of the walls. And… in essence, that's really all there is to the plot. But traditional narrative really isn't the focus here, and no simple synopsis could truly evoke the unique experience that Lowery and his collaborators are able to create -- that is, so long as viewers are open to embracing the movie's lyrical rhythms and atypically prolonged pacing. Eschewing traditional coverage in favor of a more minimalist approach, the film makes frequent use of long, single shot takes, often with static framing or slow, subtle camera movements. This leisurely cadence to the runtime helps to engender a sense of extended reality, evoking an almost hypnotic tempo that enhances the movie's ethereal storytelling and underlying examination of passing time. Small moments, like an early shot featuring C and M embracing as they fall asleep, are given gentle emphasis as the camera continues to linger unbroken, allowing the smallest changes within the image to carry heightened impact. Another sequence, this time focused on M as she almost eats an entire pie in a burst of overwhelming sorrow, could basically serve as a litmus test for whether viewers will be able to continue the journey laid out before them. Though perhaps a tad too self-indulgent for its own good, this scene offers a startling representation of grief and serves as a good example of how the director is able to use unassuming visual and editing choices to draw out specific instances. Conversely, as the ghost remains relegated to the house, years suddenly pass as if they were mere seconds, before eventually settling into episodic segments along the way, slowing and speeding down the movie's flow of time. All the while, the ghost is ever-present, gliding through corridors and rooms as if waiting for something; an eternal bystander often constrained to the edge or background of the frame, trapped in a bittersweet purgatory of remembrance and observation. Literally cloaked in a white sheet, the image of Affleck in the role should be instantly laughable -- and yet, Lowery and his team somehow avoid any unintentional comedy. Sure, there is an inherent absurdity to the character that is acknowledged to some degree, but by and large the slowly cascading specter becomes a genuinely haunting figure, full of melancholy and palpable longing. Though the thought of Casey Affleck simply lumbering through a house while dressed as a child's idea of a ghost might not sound like the most stimulating way to spend 90 minutes, the dreamy aesthetic and otherworldly mood that the filmmakers forge, end up creating a hypnotically captivating experience, tackling powerful concepts tied to love, loss, and the apparent impermanence of existence. Gradually revealing a scope far more involved than one might initially expect, the movie becomes a poetic rumination on moments both fleeting and eternal, on lasting, lingering connections undiluted by the vast gulf of time. As the movie ultimately folds into itself, Lowery achieves just the right level of implied meaning and lasting ambiguity. A Ghost Story is an odd, sad little film. Through a cinematic form both simple and strikingly evocative, the movie guides viewers into a hazy twilight world just slightly adjacent to our own, cast in the lonely glow of magic hour. Following the rhythms of a tone poem more than a conventional narrative, the film's frequent lack of dialogue and traditional drama certainly won't be for all audiences. But viewers who are willing to let the movie's poignant sights and sounds wash over them will find an achingly bittersweet tale about waiting and watching -- about connections, and memory, and hidden words forever unspoken. 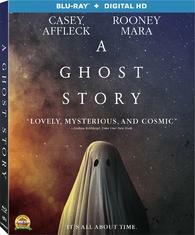 Lionsgate presents A Ghost Story on a BD-25 Blu-ray disc housed in a keepcase with cardboard slipcover. Instructions for an UltraViolet Digital Copy are included inside. After some skippable trailers, the disc transitions to a standard menu. The packaging indicates that the release is region A coded. The movie is provided with a 1080p/AVC MPEG-4 transfer in the 1.33:1 aspect ratio. Marked by an unassumingly stylized look, the modest yet striking image comes through with a strong video presentation. Shot on the Arri Aelxa, the source features a light to moderate layer of digital grain for added texture which, when coupled with the 1.33:1 aspect ratio, helps to create a faintly vintage quality. Clarity is solid but the picture is definitely on the soft side compared to other contemporary releases, and while this aesthetic does limit fine detail, it helps to enhance the movie's dreamlike mood. Colors transition between predominantly cool tones, emphasizing the story's somber tone, and warmer hues during key scenes. Contrast is decent, but a few darker sequences feature bluish or greyish blacks. And though the encode itself is mostly free from any issues, some extremely minor posterization does creep up during a couple fading transitions. A Ghost Story comes to Blu-ray with an appropriately understated yet potent image, preserving the film's delicately haunting cinematography through a technically sound transfer. The film is presented with an English DTS-HD MA 5.1 track, along with optional English SDH and French subtitles. Quietly engrossing, the mix uses key effects work and building music cues to extend the movie's hypnotic sense of atmosphere. Some early, whispery conversations are a bit on the soft side, but the film's sparse use of dialogue comes through cleanly and the movie's extended monologue scene features ample presence. Though subtle in nature, the delicate soundscape offers immersive hints of ambience, layering gentle wind chimes, chirping birds, creaking doors, and other atmospherics throughout the track. Directionality is also employed well, transitioning pattering footsteps to the left, right, and surrounds, creating an extended sense of space. More ethereal sound design work is also employed during specific scenes, including the ghost's initial introduction, faintly altering the background commotion of a hospital with eerie distortion. Likewise, key sequences offer robust bursts of LFE, including bellowing thunder and aggressive cues when the ghost is angry. The movie's moody score and central music track, "I Get Overwhelmed" by Dark Rooms, also come through with strong separation, fidelity, and low-frequency presence as they build. Subdued but surprisingly spacious, the audio perfectly complements the film's minimalist sense of lonely ambience, revealing a case where less really can be more. Lionsgate has put together a solid collection of supplements, including a commentary and a roundtable discussion with the filmmakers. All of the special features are presented in 1080p with Dolby Digital 2.0 sound. Audio Commentary with Filmmakers – Director David Lowery, Cinematographer Andrew Droz Palermo, Production Designer Jade Healy, and Composer Daniel Hart all sit down for this track. The group offer a laid back and informative discussion, elaborating on changes made during the shoot, lighting and camera choices, working with the 1.33:1 aspect ratio, sound design, music, effects, the origin of the movie's long monologue scene, and the surprising expense of erasing Casey Affleck's tattoos. All in all, a great listen for fans of the flick. A Ghost Story and the Inevitable Passing of Time (HD, 20 min) –In a playful nod to the movie's subject matter, this is a roundtable with cast and crew conducted in a supposedly haunted location in the dark (with night vision so we can see the participants). 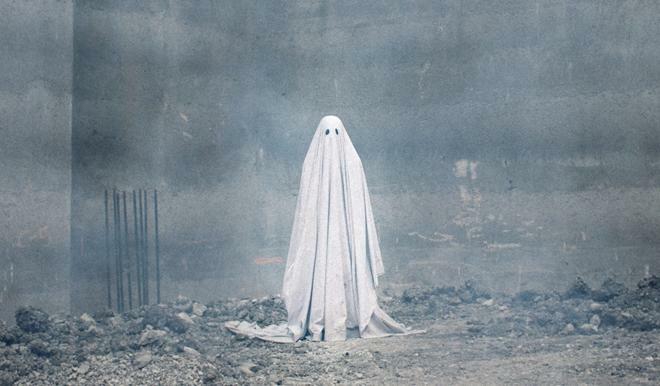 The group discuss the story's origins, the surprisingly complex process of designing the ghost costume, the movie's visuals, locations, and their close working relationship on set. A Composer's Story (HD, 5 min) – Here we get an interview with the film's composer, Daniel Hart, as he explains how he developed the soundtrack's mood and created pieces of ambient music by stretching out sections of the film's central music track. Deleted Scene (HD, 6 min) – This is an excised sequence likely cut for pacing featuring another long take as Casey Affleck's character makes coffee and gets lost in thought on the morning of his death. David Lowery's A Ghost Story is a haunting piece of poetic filmmaking. Marked by a lyrically absorbing aesthetic, the film examines deep themes tied to love, loss, and the very passage of time itself. Though modest, the video and audio presentations offer a delicately immersive experience. Likewise, the included supplements provide some worthwhile insights into the production. While the movie's slow pacing and loose narrative might alienate some audience members, this disc is highly recommended for viewers who are open to more experimental forms of filmmaking.